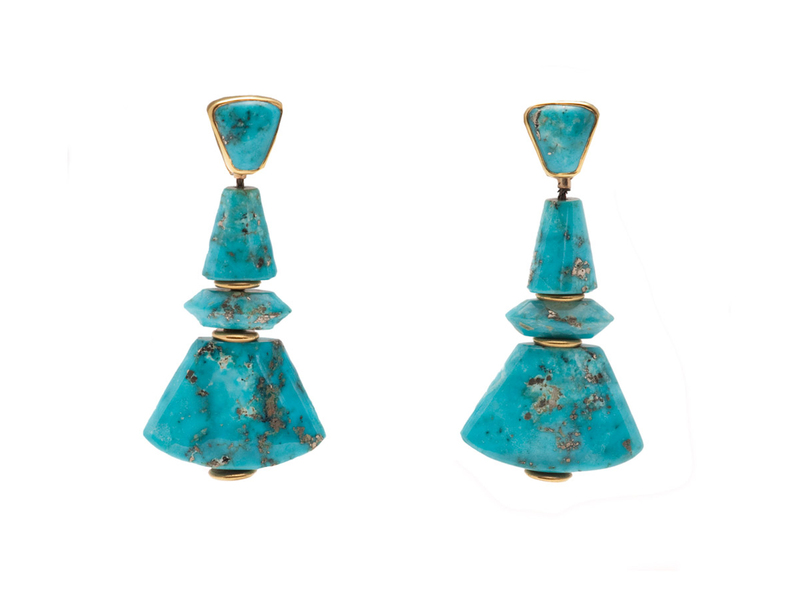 These fabulous Morenci Turquoise Earrings feature Morenci turquoise stones and 22k yellow gold bead spacers. Morenci turquoise was mined in Greenlee County in southeastern Arizona. Morenci is highly prized for its beautiful blue colors, which vary from a light to a very dark blue. Also for its unusual matrix of iron pyrite or “fool’s gold” that when polished often resembles silver. 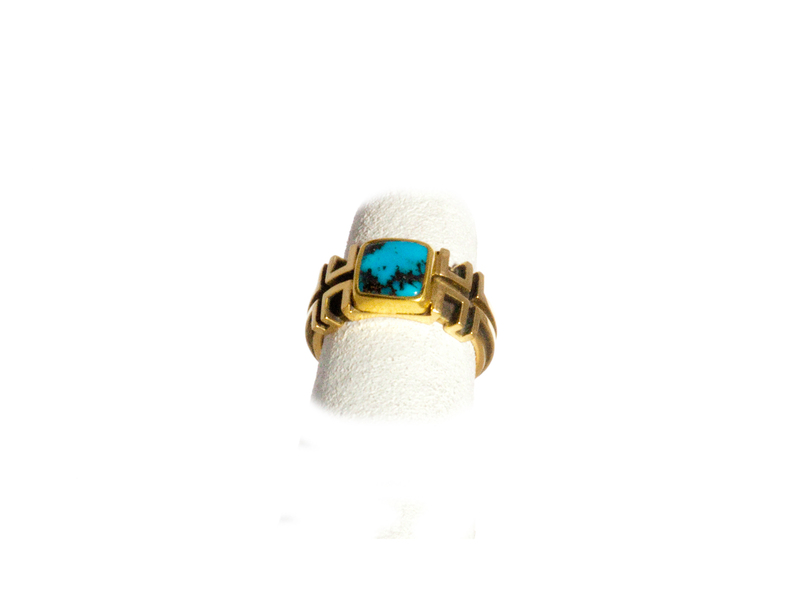 The turquoise was a by-product of the Morenci copper mine in Arizona. 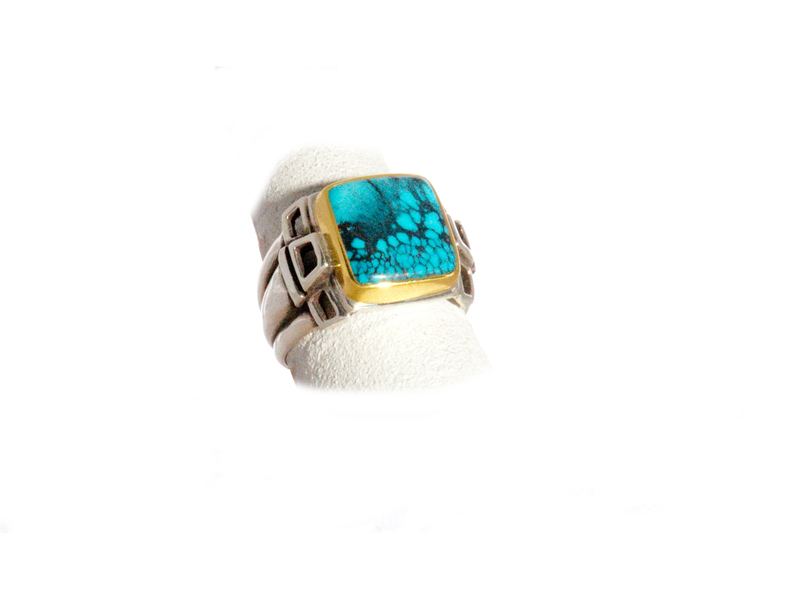 For many years heavy-equipment operators at the mine would “lunch box” the high-grade turquoise out. The March 1977 edition of the “International Turquoise Annual” states, “Many years ago, while mining for copper, workers unearthed a large zone of turquoise-bearing rock and, realizing its value, began working this zone, neglecting the copper. In order to ensure copper production continuing, the copper company that held the mine at the time took the entire turquoise deposit, which was extensive, and buried it under thousands of tons of waste rock from the pit and it is still sitting there. Santa Fe artist Scott Diffrient calls his works “ modern artifacts,” and these earrings superbly exemplify that— chic enough to wear with the most avant garde fashions, yet looks as if it could have been worn several thousand years ago by a Mayan princess. 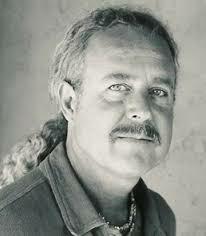 For over forty years, Santa Fe-based Scott Diffrient has created one-of-a-kind pieces that have become highly valued collectibles sought after by the most astute jewelry collectors. 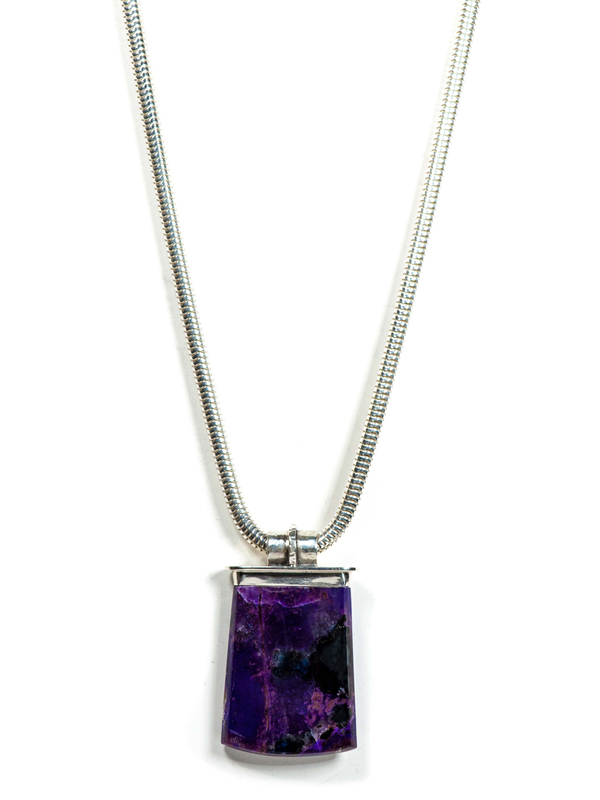 Diffrient, a forerunner in the world of contemporary bead making, is one of the few jewelry designers practicing stone bead making and lapidary art—sourcing the rough stones directly from the miners, doing his own meticulous stone cutting, investing the time and exactitude necessary to produce fine works. 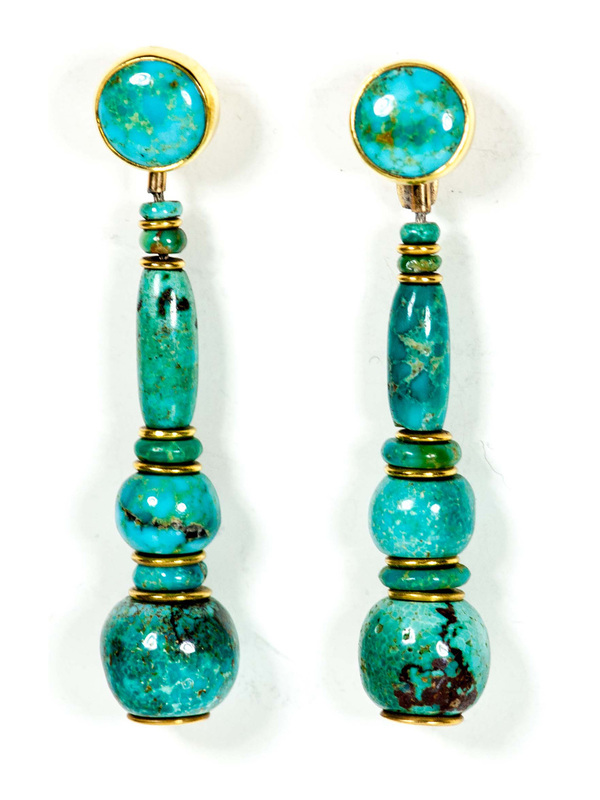 The Morenci Turquoise Earrings measure 2” inches long. His artistry, influenced by his love of ancient cultures, imparts an ancient charismatic power to each piece.